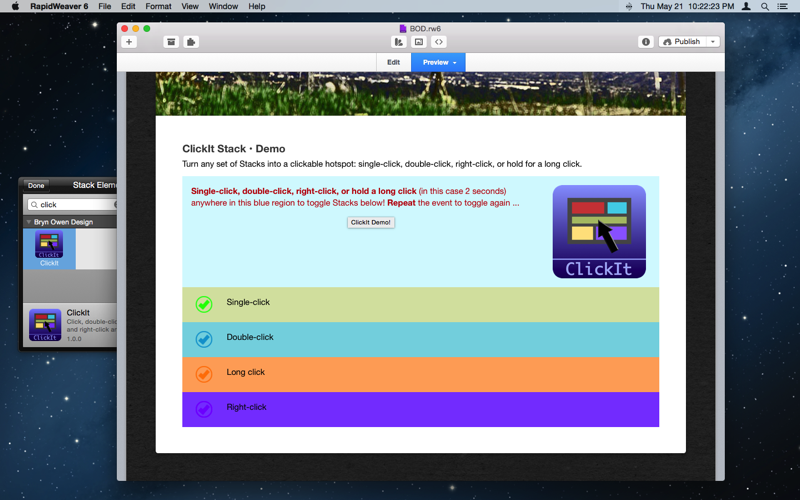 Turn any set of Stacks into a clickable hotspot: single-click, double-click, right-click, or hold for a long click. 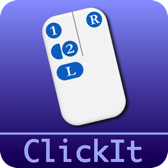 Drop any Stacks inside ClickIt and they become a clickable hotspot: link to other pages, or show another set of hidden Stacks. 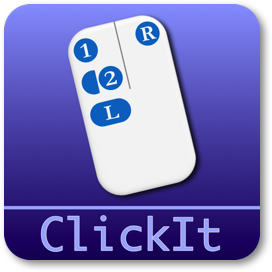 You have control over what action is taken on a single-click, double-click, right-click, and/or a long click. Set hover effects and add an optional tooltip just like a link. 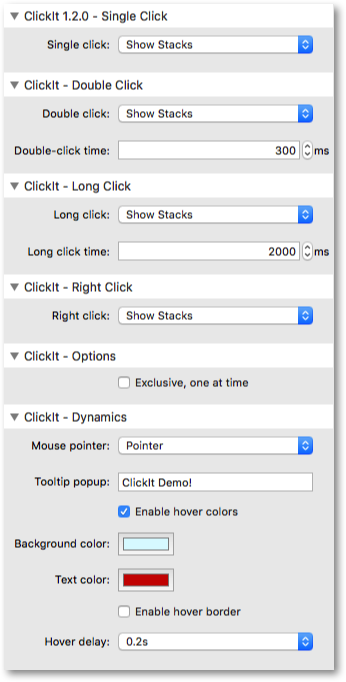 Each type of click event has its own set of controls for what action is taken: do nothing, show hidden Stacks, or jump to a page or URL. 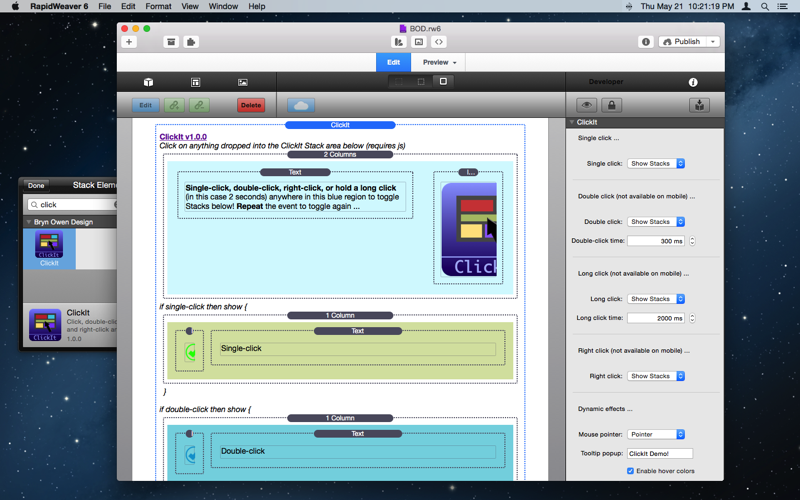 The Stack has optional hover effects that you can enable and customize as well. Single click Choose an action for single-click: Nothing disables this click; Link to page jumps to another URL like an href; Show Stacks shows stacks you choose in the edit area. Page link Select a link to jump to on a single-click of the Stack area. Double click Choose an action for double-click: Nothing disables this click; Link to page jumps to another URL like an href; Show Stacks shows stacks you choose in the edit area. Page link Select a link to jump to on a double-click of the Stack area. Double-click time Set the amount of time in milliseconds within which two successive clicks of the mouse on the Stack area will trigger the double-click. The default is 300ms, but can be set to other values. Note: a single-click is not registered until this amount of time has passed. Long click Choose an action for long click: Nothing disables this click; Link to page jumps to another URL like an href; Show Stacks shows stacks you choose in the edit area. Not available on mobile. Page link Select a link to jump to on a long click of the Stack area. Long click time Set the amount of time in milliseconds you need to hold down the mouse on the Stack area to trigger the long click. Default is 2000ms which is two seconds. Right click Choose an action for right-click: Nothing disables this click; Link to page jumps to another URL like an href; Show Stacks shows stacks you choose in the edit area. Not available on mobile. Page link Select a link to jump to on a right-click of the Stack area. Exclusive, one at time Check this to allow only of the four possible Show Stacks to be displayed at any one time. Mouse pointer Set the type of pointer for the mouse when it hovers on the Stack area. Tooltip popup Show this string when the mouse is hovered over the Stack area. Leave this blank for no tooltip. Enable hover colors Enable color changes on mouse hover over the Stack area. Background color Set the background color of the Stack area on mouse hover. Text color Set the text color of the Stack area on mouse hover. Enable hover border Enable border changes on mouse hover over the Stack area. Border color Set the border color of the Stack area on mouse hover. Border width Set the border width of the Stack area on mouse hover. Hover delay Set the transition speed of all hover effects. Single-click anywhere in this blue region to Reload this page!